Botox is a wonder cosmetic injectable medicine which is used to cosmetically treat muscular conditions like wrinkles by temporarily relaxing the muscles. Fine lines, wrinkles, and expression lines develop even before some people turn thirty due to sun exposure and excessive squinting or expressing. Other than for wrinkles BOTOX® is by neurologists for younger cerebral palsy patients and younger people with squints. Botox only works on fine wrinkles caused by expressions that are due to muscle contraction like forehead frown lines, crow’s feet, and bunny lines on the nose. When the same wrinkles are longstanding and have left permanent marks on skin or if there are additional loose folds of skin, the result of BOTOX® are partial. BOTOX® does not work on some other wrinkles like cheek wrinkles and deep folds like nasolabial folds. Age is no bar for BOTOX®, and it is a safe procedure. At what age can Botox injections be started? Botox is not just for older people.Botox can be used for facial shaping and smile correction in teens. Fine lines, wrinkles, and expression lines develop even before some people turn thirty due to sun exposure and excessive squinting or expressing. Other than for wrinkles BOTOX® treatment has been used by neurologists for younger cerebral palsy patients and younger people with squints. Does BOTOX® work on all kinds of wrinkles on the face? BOTOX® Cosmetic treatment only works on fine wrinkles caused by expressions that are due to muscle contraction like forehead frown lines, crow’s feet, and bunny lines on the nose. When the same wrinkles are longstanding and have left permanent marks on skin or if there are additional loose folds of skin, the result of BOTOX® Cosmetic treatments are partial. BOTOX® Cosmetic does not work on some other wrinkles like wrinkles on cheeks, chin, around the mouth, under the lower eyelid. It also does not work on deep folds like nasolabial folds.These wrinkles can be treated by Juvederm. How long does the effect of BOTOX® last? Usually 3 to 5 months. Duration depends on patient variation, injection technique and the number of units injected. Can BOTOX® injections be repeated any number of times? Present research evidence based on years of BOTOX® usage throughout the world indicates that BOTOX® can be injected safely repeatedly. Will my face look different or mask like after BOTOX®? You will look relaxed, and your skin will look more youthful and naturaL when Botox is given by an experienced plastic surgeon. If I get BOTOX® injections done, will I not need a surgical facelift? BOTOX® treatments and surgical facelift address two entirely different sets of problems. BOTOX® treatment works on selected superficial expression lines. Surgical facelift, on the other hand, treats excessive sagging skin and muscles. Expression lines form earlier than sagging of face. BOTOX® treatment is started earlier and with advancing age facelift is done. BOTOX® is frequently continued even after the facelift. Will a Botox® treatment remove my expression lines completely? Early expression lines disappear without a trace. In late cases, creases are permanently etched into the skin. In such a situation, they can be softened by BOTOX® Cosmetic treatments, and simultaneously or later a temporary filler can be injected to completely erase the wrinkles. 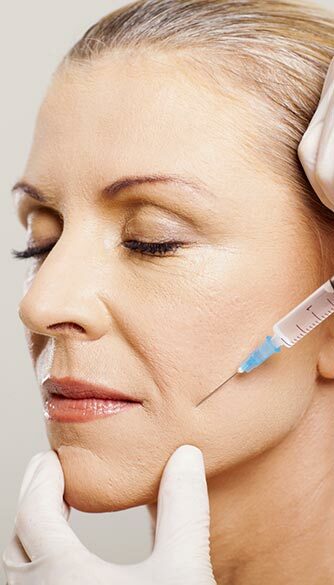 Are there different types of BOTOX® treatments available in the market? BOTOX® Cosmetic is the brand name of a USFDA-approved company. Other brands of Botulinum Toxin are available too. Is BOTOX® treatment used for other purposes also? Even before the usage of BOTOX® treatment started for facial wrinkles, BOTOX® was being used for correction of squints and tight muscles in cerebral palsy. BOTOX® treatment is also used for treating migraine headaches, excessive sweating of palms, soles, and axilla, and for softening the angles of the jaw.